FA: Bill Westbay, Larry Derby, and Mike Weiss. 1975. Climb two pitches up a right-facing corner 200 feet right of The Organasm. Wild stemming and jamming hidden inside the corner leads to a bolted anchor on a ledge on the left side of the crack system. The ledge on top of Pitch 1 has three distinct large boulders on it. Pitch 2 continues up a wide hands crack in a right-facing corner to the huge vegetated ledge. Rack: 2 ea to 4.5”, one 5.5”, extra 3-4”. 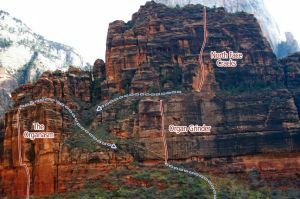 Descent: walk east and scramble down vegetated ramps between The Organasm and Organ Grinder. Which SuperTopo guidebooks include a topo for Organ Grinder?